The Manor Hotel01263 720309work01263 726933fax HotelThe Manor Hotel extends a warm welcome from an idyllic setting, where you can relax and enjoy the delights of beautiful sandy beaches and the stunning north Norfolk countryside. A beautiful example of a Victorian hotel, elegantly refurbished. 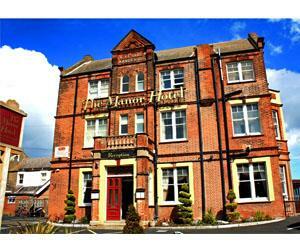 The Manor offers classic decor combined with modern comforts with a warm friendly atmosphere. Located right on North Norfolk's spectacular coastline, in the picturesque village of Mundesley on Sea and just a few miles from Cromer, the Broads, The Broads and yet only twenty miles from Norwich, making it an excellent base to explore North Norfolk's historic towns and villages, the natural beauty of the salt marshes and the peaceful country and coastal walks. The Manor Hotel is a coastal escape that incorporates a high level of customer service, with attention to detail, so whether you are visiting for business or pleasure you can relax and enjoy this coastal retreat. The Manor Hotel is licensed for civil ceremonies and has comprehensive wedding packages that can be tailored to your individual requirements. Many of the rooms and the garden, with the option of a marquee, all boast spectacular uninterrupted sea views that make an excellent backdrop for your special day. The Manor Hotel extends a warm welcome from an idyllic setting, where you can relax and enjoy the delights of beautiful sandy beaches and the stunning north Norfolk countryside. A beautiful example of a Victorian hotel, elegantly refurbished. The Manor offers classic decor combined with modern comforts with a warm friendly atmosphere. A true country and coastal hotel, The Manor Hotel welcomes you to come in and experience the charm of a peaceful retreat where history and hospitality combine. From A149 Six miles from North Walsham and 22 miles from Norwich.